Cleanroom Classifications // How Do Cleanrooms Work? What these cleanroom classifications represent is the level of measured contamination from 1 particle at .5µm per cubic foot of air to 100,000 particles at .5µm per cubic foot of air. 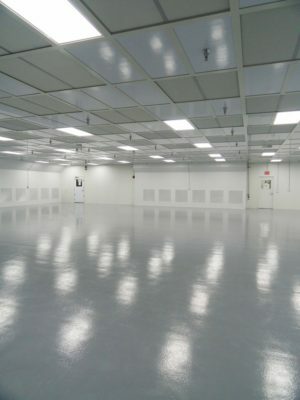 Cleanrooms are built with smooth, hard and easily cleanable surfaces to minimize contamination. Materials such as walls, ceilings and floor systems are all designed to minimize internal particulate. Temperature control, humidity control, static control, sound and light levels are all critical factors when creating a cleanroom. The way air enters, is filtered, circulates and leaves a cleanroom is most important. Outside air is filtered to exclude particulates, and the air inside is constantly circulated through High Efficiency Particulate Arrestors (HEPA) and/or Ultra Low Particulate Arrestors (ULPA), to remove internally generated contaminants. People are the largest particle producer in a cleanroom and many precautions are made to protect the product. Personnel enter and leave cleanrooms first through gowning rooms, then often through airlocks by following strict cleanroom standards. They wear protective clothing such as coveralls, hairnets, facemasks, booties and gloves. Materials and equipment are next in line as generators of contamination, which limits what they can be made out of when used in a cleanroom.